Whose Voice Will You Listen To Today? My son played on his high school’s basketball team. At one of the games, I noticed a man on the home side of the court video recording of the game. I also noticed a man on the opposing side doing the same. “Steve, who are those men with the video cameras and why are they recording the game?” I asked my husband. Ah, a sudden glory moment. I don’t know much about sports, but I do know a bit about how the enemy works. He records the video of our lives and looks for our weakness to bring us down—to plan his attack, to defeat us. The Bible has many names for that enemy: Satan, the great serpent, the deceiver, and the devil. But the most telling name is found in Revelation 12:10: the accuser who accuses believers before God day and night. Some say that the devil’s main role is tempting mankind to sin. But I believe what trumps even temptation is his role as the accuser who shackles us with shame and condemnation once we succumb to the temptation. He paces before God saying, “She did this and she did that.” He plays and replays the video in the theater of your mind, pointing out all your faults and weaknesses to bring you down. He is AGAINST you. But remember, there were two men creating a video of Steven’s game. 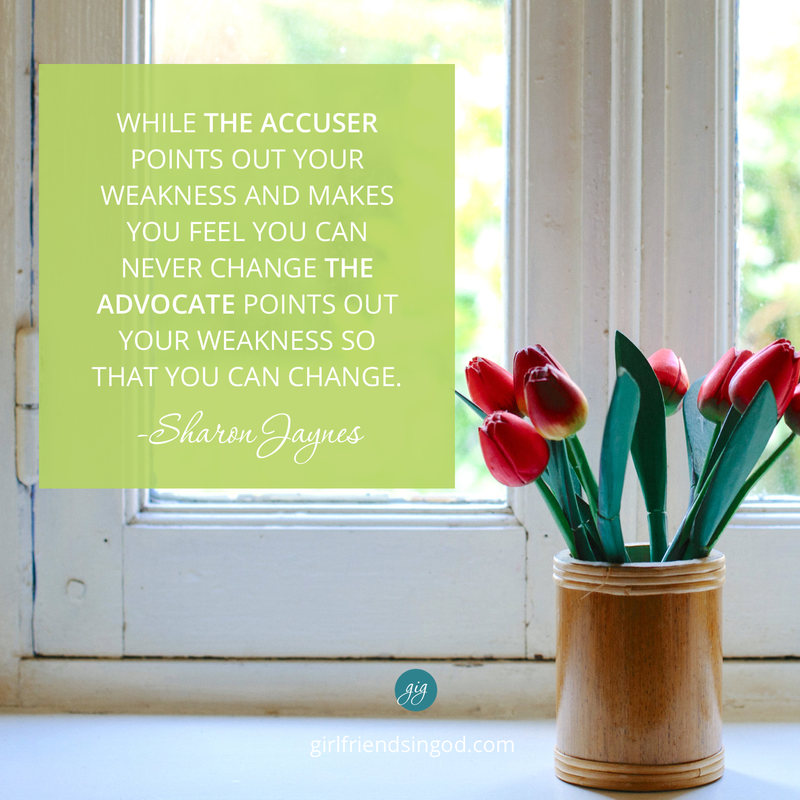 Just as the accuser is against you, there is someone else who is for you. Before Jesus went to the cross, He assured His followers that He would not leave them as orphans. He promised to send the Spirit who would encourage, enlighten, empower, and intercede for all believers. And then Jesus gave the Spirit a name: the Advocate. “But the Advocate, the Holy Spirit, whom the Father will send in my name, will teach you all things and will remind you of everything I have said to you” (John 14:26). While the accuser points our your weakness and makes you feel you can never change, the Advocate points out your weakness so that you can change. It’s the same video, but seen from a different perspective. So tell me, who’s voice are you going to listen to? Who’s voice are you going to believe? Remember this, the voice you listen to will determine your destiny. Let’s determine together to listen to the voice that loves us most. Dear LORD, help me distinguish between the accuser’s voice and the Advocate’s voice. I know I have a choice when it comes to whom I listen to: condemnation or correction. Thank You for Your great love that never condemns, but lovingly corrects. Think of a scenario in your life from the past few weeks in which you felt condemned. Now, think about your thoughts. Were they more like the man with the camera pointing out your weaknesses to bring you down, or like the man with the camera who wants to make you better? Today’s devotion was taken from my book, Take Hold of the Faith You Long For: Let Go, Move Forward, Live Bold. And if there is anything we need to let go of in order to move forward it’s shame and condemnation. Check out this book to learn how to let go of everything that holds you back from experiencing all that God has for you, move forward in fierce faith, and live bold by taking hold of everything Jesus has already placed in you! Click on the book cover to download a sample chapter and view a quick video. And if you’re looking for a new study for your women’s group or individual study, Take Hold includes a Bible Study guide in the back. Thank you! I sure needed to hear his today. I loved the practical life example and application. Thank you for writing and sharing this with us. situation like this last week. that should of either just should of went with my head instead of my heart. but listened to my heart instead…but need to wait on GODS timing that His plan is perfect …… kept listening to the enemies LIES. hopefully w(regret) ill get another call in the future. I have read a number of your books and can’t thank you enough for all you beautifully articulate/teach all of us! I will be forever grateful! This morning’s post helped to redirect my thoughts to follow through on my original plans for the morning instead of canceling due to Alternative thoughts shouting in my head all the reasons I should not go!! Thank God and thank you for shining the light on the truth. I carried out my original plans and couldn’t be happier! I agree accuser is a main focus in his arsenal and fear, I truly did not understand the accuser until a few years ago.